and making warm, soft cinnamon rolls. 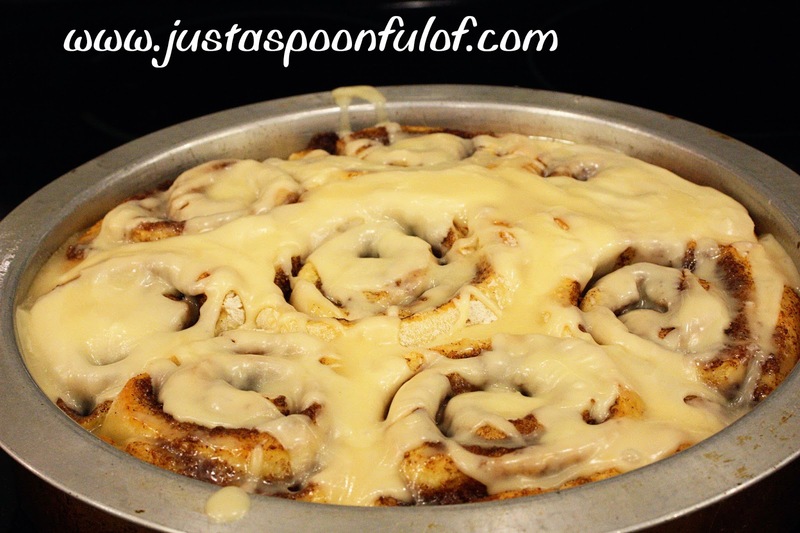 running to the kitchen drooling. and some were pretty good. Some with a weird cinnamon sugar mixture. But when Jessi made these...need...we...say...more. We had to have the recipe! Perfect for any holiday morning. They are quick to make. They use ingredients you have in your pantry. 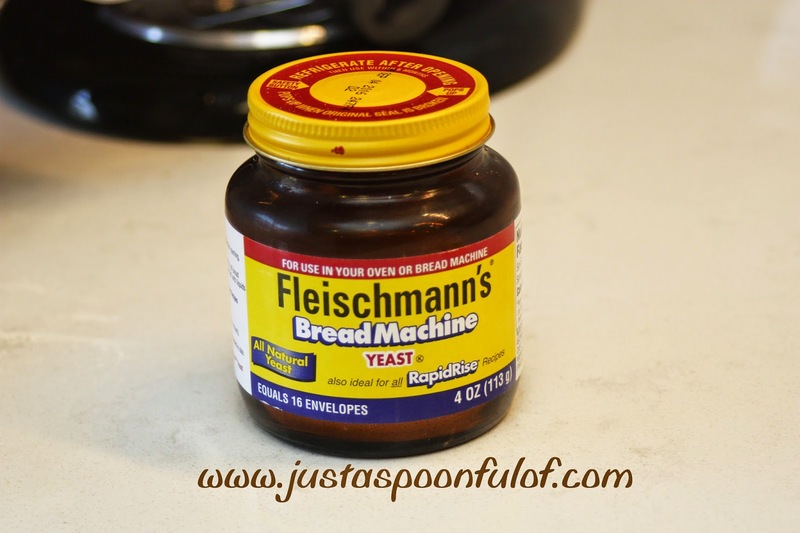 It is nice to have yeast in a jar instead of those little packages. We store ours in the refrigerator...ready whenever we need it. add it to the flour mixture with the egg. Mix well. 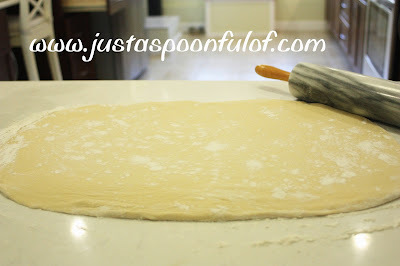 We just use the dough hook. After it is combined just let the hook do all the work. 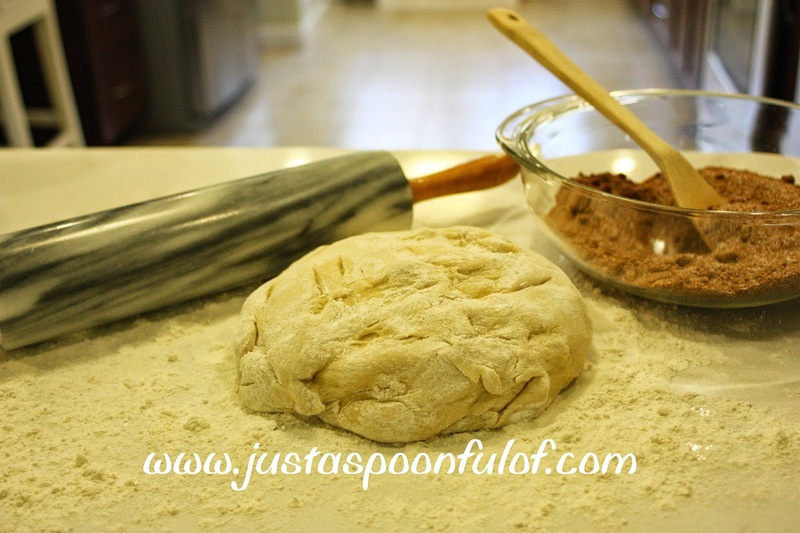 Let it mix for about 5 minutes...saves kneading by hand. When it looks like this, you are done. We use a little bit of flour to coat the ball of dough so it's easy to handle as you take it out. 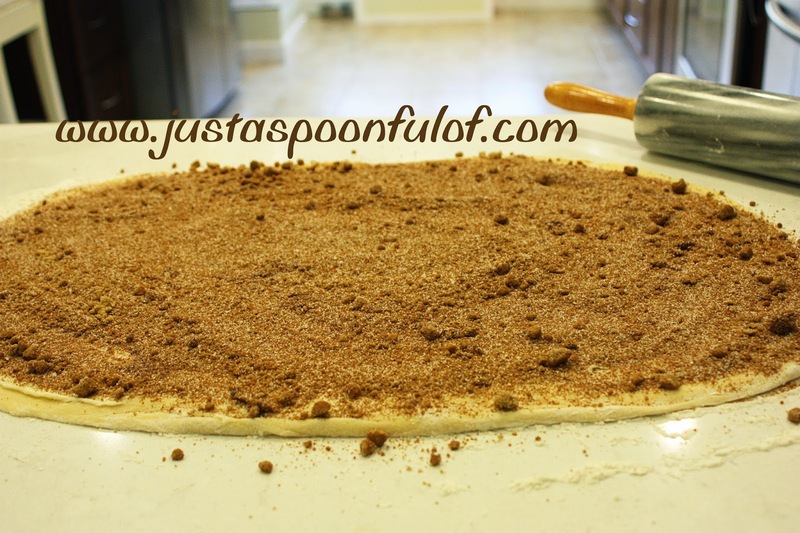 Roll the dough out on a lightly floured surface. We make our "rectangle" about 20"x13". 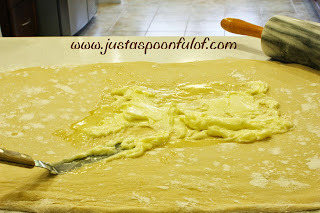 Spread the softened butter evenly. Sprinkle with this fabulous cinnamon sugar mixture. You can almost smell them baking! 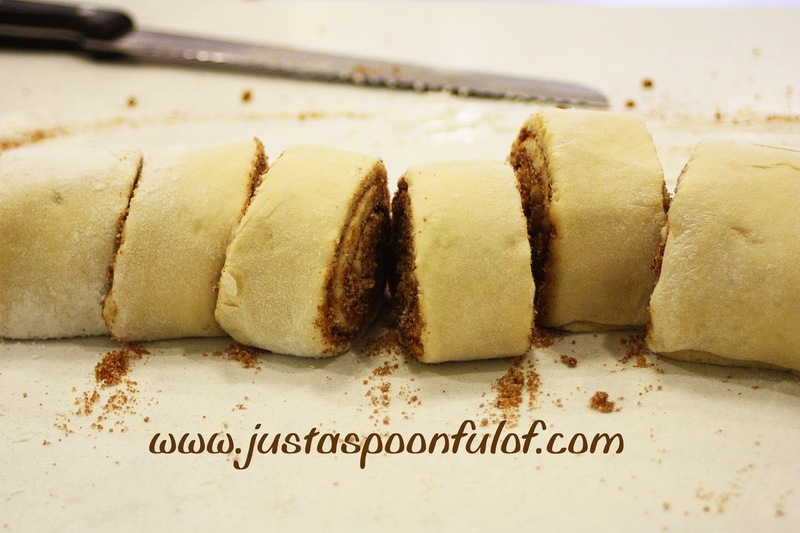 Roll the dough toward you until it is one long roll. but we just use a really sharp serrated knife. 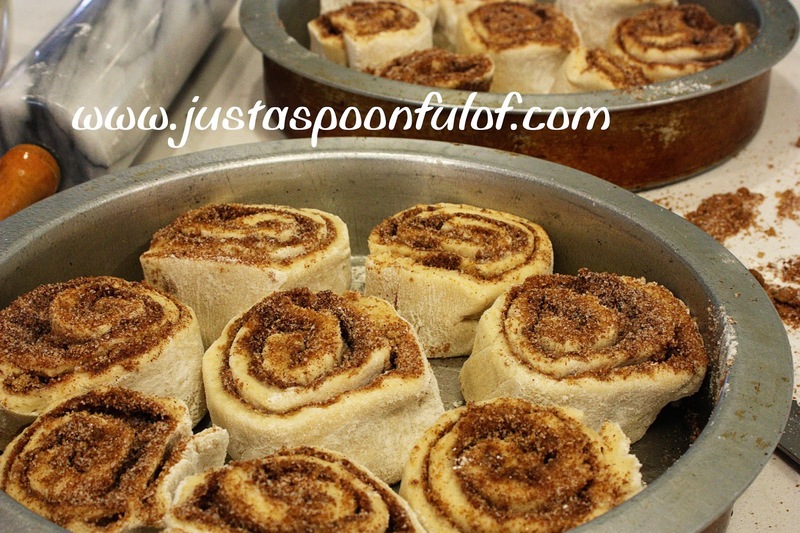 Divide the rolls evenly between two round greased pans. Place them in a warm place and let them rise for around 30 minutes. We usually use that time to preheat the oven and sit them on top of the stove. each other, they are ready to bake! 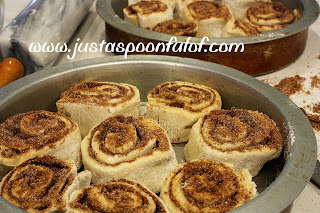 The rolls bake for about 15-20 minutes. So now is a good time to make the icing. 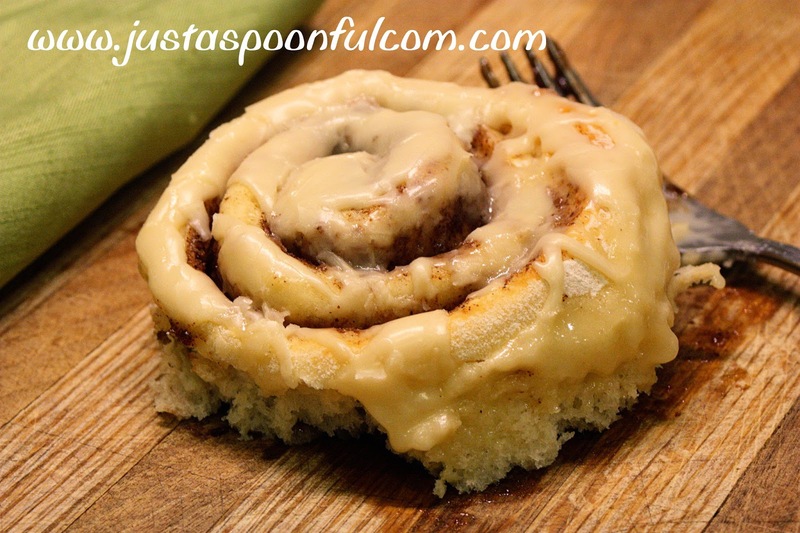 Just a simple powdered sugar recipe. Melted butter, vanilla, powdered sugar, and milk. When the rolls are golden take them out and wait for about 5 minutes.....HA! 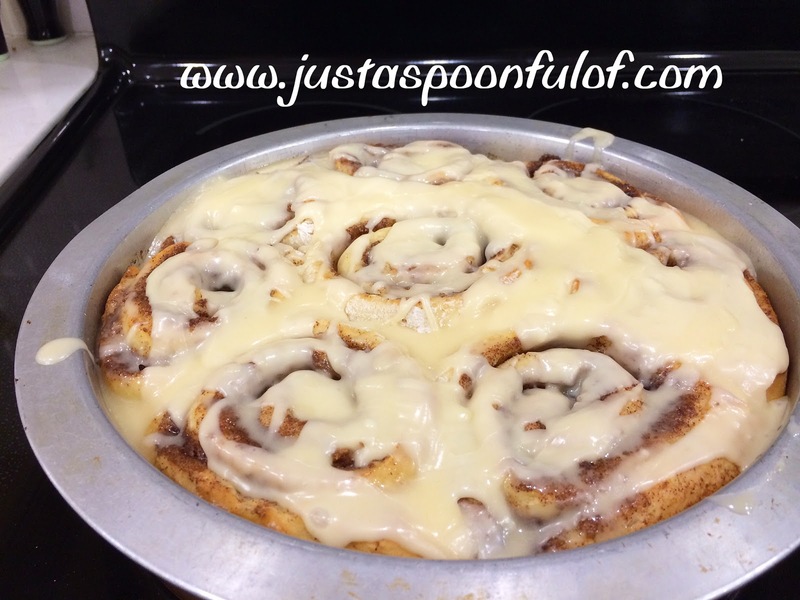 Pour the icing on the warm rolls and spread evenly. It will melt down into all the nooks and crannies. of that roll on your plate. with the cinnamon sugar goo. Combine the milk and butter in a microwavable bowl. Heat until butter is melted and milk is warm (not hot) about 1 minute 30 seconds. 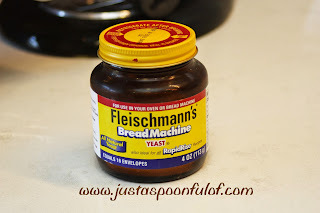 In a mixing bowl combine 3 Tbsp of yeast, 3 cups of flour, salt, and the sugar. 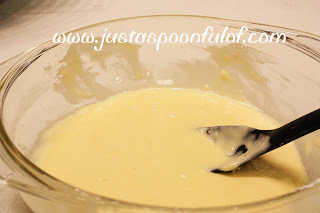 Add the milk/butter mixture and the egg. 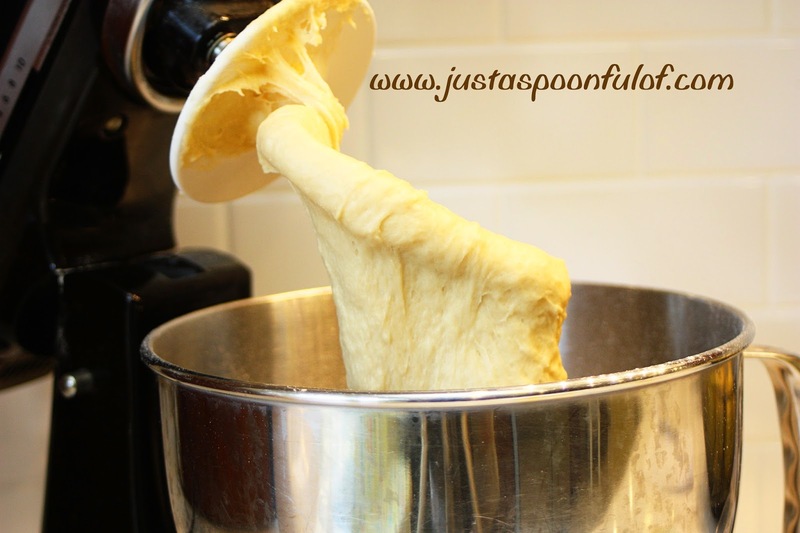 Mix well using a dough hook. Add the rest of the flour a 1/4 cup at a time. Scrape down the sides and mix for 5 minutes on medium. Cover with a clean dish towel and let sit 10 minutes. 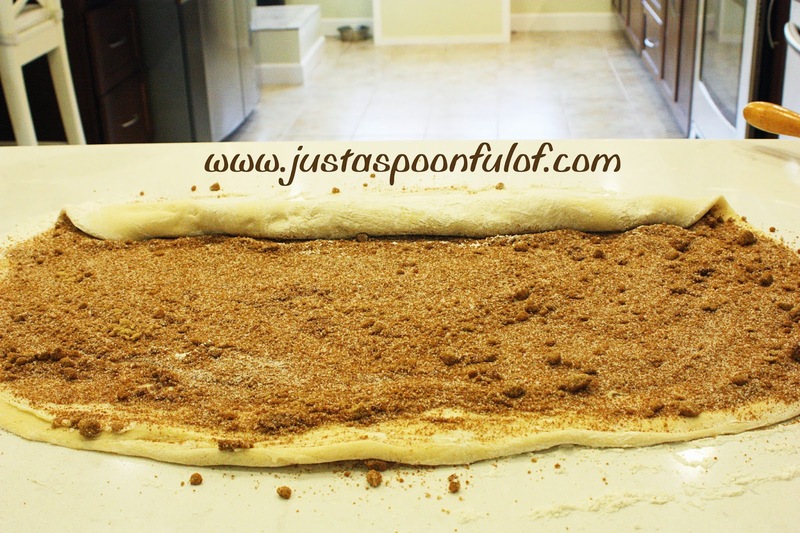 On a floured surface, roll out the dough to about 20"x13". Spread the softened butter evenly on the rolled out dough. 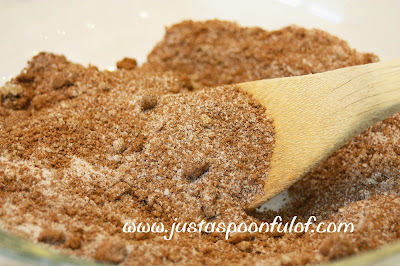 Mix the sugar and brown sugar together with the cinnamon. 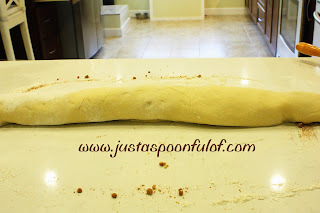 Starting with the edge farthest from you, roll the dough tightly toward you. Cut into 1 1/2" sections with a sharp knife. Divide evenly between to greased round cake pans. 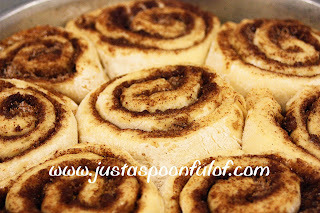 Let the rolls rise in a warm place,covered with a towel, for about 30 minutes. Bake at 350 degrees for about 15-20 minutes, until golden brown. 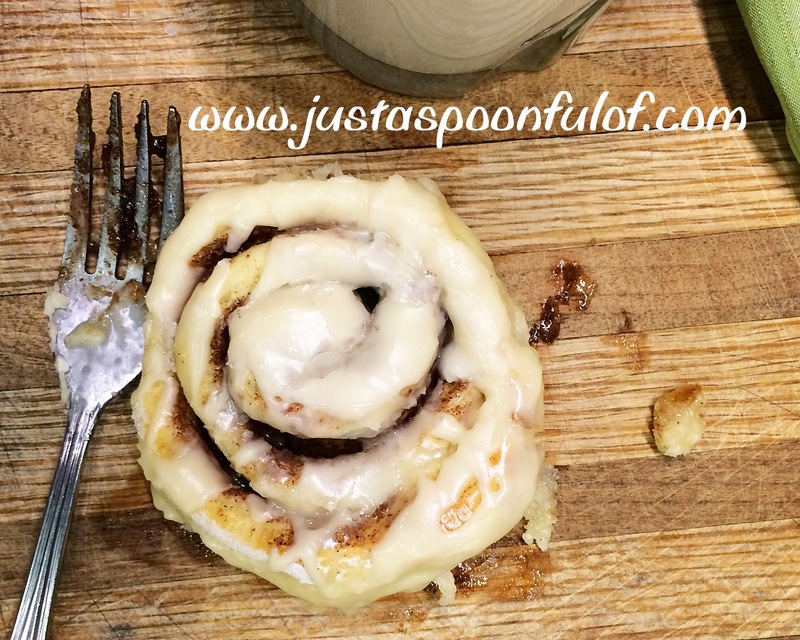 While the rolls are baking, make the icing. 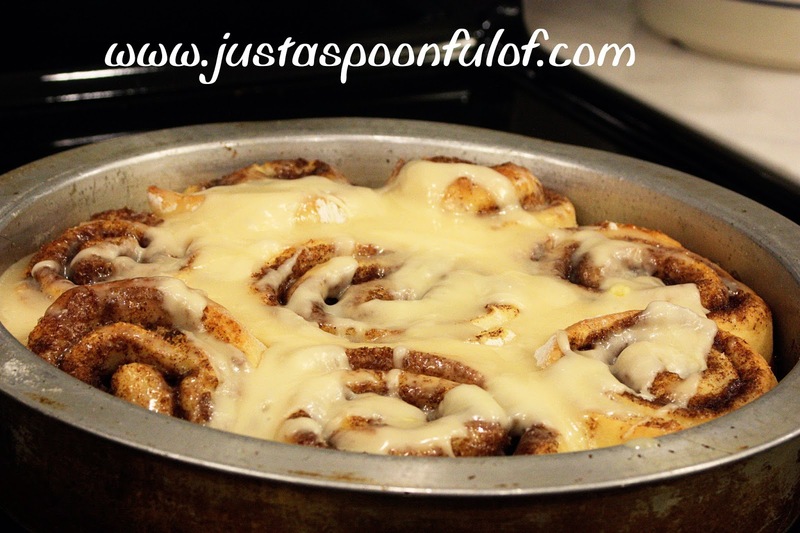 Mix together the melted butter, vanilla, and powdered sugar. Add the milk to get it the consistency you like. We like it not too thick and not too runny. After you remove the rolls from the oven spread the icing evenly between the two pans.